Depending on the region you live in, ongoing pool care can be a year round requirement. Yes, the water temperatures are cold, UV ray angles are low and your pool might not have any bather load; however your pump, filter, heater and other pool equipment are functional and need to be watched. When it’s finally the warm pool opening season, you don’t want to find that your pool surfaces and equipment damaged and unusable. By doing small, weekly pool care tasks, like balancing your water chemistry, you can save yourself from large, time-consuming repairs and replacements. If your pool is covered, remember to periodically remove any debris above the cover and check underneath it to ensure you have no unwanted surprises down there. In addition, the winter-induced wind or snow can put stress on your cover, so make sure that your cover, attachments, water bags and lawn anchors are securely attached so they don’t come loose. Water chemistry balancing is not as demanding as it may seem, but it is a crucial part of protecting your pool or spa investment. If pH, alkalinity, cyanuric acid and calcium hardness are out of standard ranges for an extended period of time, it can wreak havoc on your pool equipment and surfacing. In the winter, you should balance your pH, pool water weekly at a minimum; spa users are recommended to check their water chemistry every two to three days. In addition, use an algaecide to kill any existing algae and prevent new blooms during the winter. Your sanitizer levels can be reduced during the winter months, while still maintaining the proper water chemistry balance. Even when your pool is covered and not in use, dirt, pollen and other contaminants can still enter the water. So, remember to keep an eye on the filter gauge, perform backwashing and clean your filter per the manufacturer’s recommendations. Additionally, don’t forget to check your pool pump, heater and exposed plumbing to make sure everything is functioning properly and there are no leaks. If water is left in your equipment during the winter, the cold weather can freeze and expand the water and ruin your equipment and plumbing. So remember keep an eye on your freeze guard to ensure that your pool equipment has circulation when temperatures plummet. This can help you avoid expensive repairs from frozen equipment or plumbing. As debris builds up, remember to empty your skimmer baskets, pump baskets, floor cleaner containers and cleaner bags. This will keep your water and equipment cleaner, while also making your life easier in the spring. Maintaining clean walls, floors and other pool surfaces will prevent algae growth. Skimming, vacuuming and brushing organic debris on a weekly basis is a great off season pool care habit that will save you time dealing with a green, dirty water in the spring. Tip: Don’t forget to brush the hard to get areas, including behind ladders, steps and corners. Always make sure your pool’s water level is correctly topped off to protect your pump and keep the pool primed. The right pool water level can depend on the climate you live in. 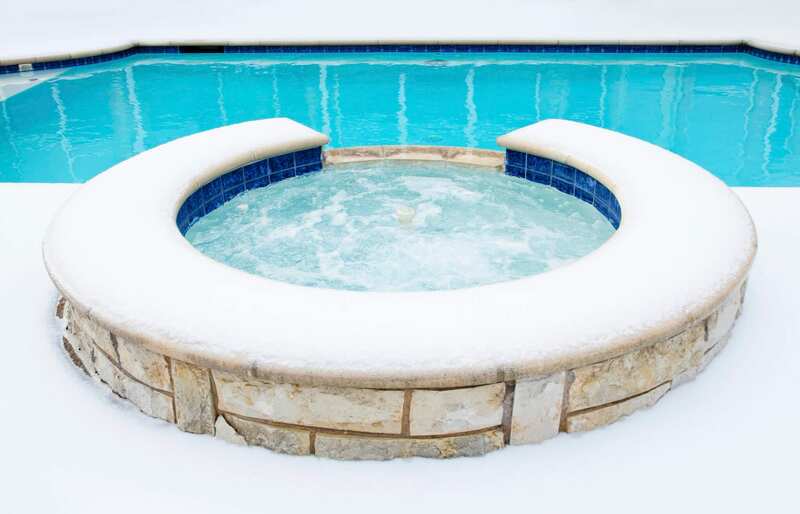 If you live in a warmer environment, that doesn’t experience freezing temperatures, your pool water should almost be filled to the top during the winter. However, if you are located in a cold environment, your pool water should be four to six inches below the skimmer in the winter months. Spending a little time each week on your off season pool care will make a big positive impact on opening your pool this spring and summer. Louie Warco brings expertise in operations management and 10 years experience in service and maintenance in the pool industry to Clear Comfort. He joined Clear Comfort in 2015 and, as manager of customer success, he ensures our customers enjoy a sustainable, nontoxic and healthy swimming experience. Outside of the office, Louie loves to swim, cycle and golf. Summer Giveaway: Swim. Enter. Win.